An undated image showing the location of a suspected drunk driving crash in Healdsburg. 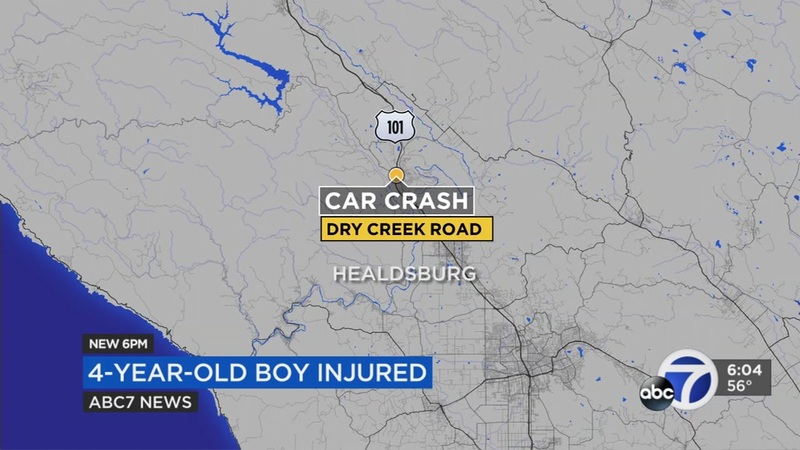 HEALDSBURG, Calif. -- A 4-year-old boy was seriously injured when his mother crashed while allegedly driving drunk on U.S. Highway 101 in Healdsburg late Wednesday night, according to the California Highway Patrol. The child was apparently not wearing a seatbelt or in a child safety seat when his mother, identified as 36-year-old Melissa Miller of Santa Rosa, crashed near Dry Creek Road just before midnight, CHP officials said. Miller was speeding in the 2004 Saturn VUE and couldn't negotiate a curve in the road. The Saturn went straight off the road, rolled down an embankment and crashed into a large redwood tree. Her son was partially ejected from a rear window and was unconscious when emergency crews arrived. He was flown to UCSF Benioff Children's Hospital in Oakland where he is in stable condition, CHP officials said. Miller was already on probation for a drug charge and was found to be under the influence of alcohol. She was arrested on suspicion of felony DUI, violation of probation and child endangerment, according to the CHP.